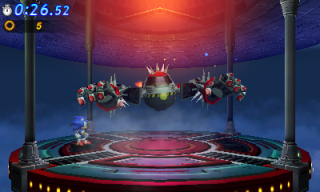 The Big Arms boss from the end of Launch Base Zone returns in all its mighty glory to take on Classic Sonic once more. Fighting again underneath the rising Death Egg, the boss now has a few differences from its previous fight, including some new attacks. It will do its grab attack from the original, but it also utilizes the 3D arena to change positions and attack from different angles. The boss also has a new hand slam attack, an air push move, and a different method of its spike hair attack. Instead of going below deck like the original fight which wouldn't really work in this context, it charges close to the ground to produce the same attack. Hit Eggman whenever there is an opening, and after 8 hits the fight will be yours. This page was last edited on 8 April 2018, at 09:36.